It’s often said that the construction professional has to be a “jack of all trades, and master of all.” This text covers a wide range of subjects, reflecting the breadth of knowledge needed to understand the dynamics of this large and complex industry. 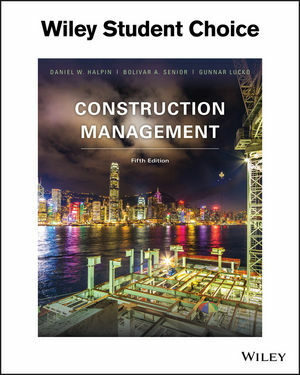 This edition includes updated chapters on planning and scheduling, a new chapter addressing linear scheduling methods, material regarding the historical background of construction as a profession, and includes an Instructor Resource of solutions to the end-of-chapter review exercises. This text has become a standard course text at many universities. The first four editions have enjoyed wide success as an introductory treatment of the subjects which are critical to success in the construction industry. This fifth edition preserves the features that have been most appreciated by its users throughout the years, and adds suggestions provided by instructors and students through formal surveys and informal feedback to the authors. To provide increased coverage of topics related to the financial side of the house, two new chapters have been added addressing the impact of taxes on the operation of a company and the evaluation of borrowing, lending, and other financial opportunities using the mathematical concepts of engineering economy. New problems and exercises have been added. Chapters on planning and scheduling that have been streamlined to provide a smoother presentation. A new chapter addresses linear scheduling methods in detail as well as the scheduling impact of resource allocation and resource planning has been added. Coverage has been added on the historical background of construction as a profession and a discipline to help the student become excited about the multifaceted nature of realizing great construction projects. DANIEL W. HALPIN is Professor Emeritus and retired Bowen Head of the Division of Construction Engineering and Management at Purdue University. He is a graduate of the U.S. Military Academy at West Point and received the MSCE and PhD degrees in Civil Engineering from the University of Illinois in 1969 and 1973. Prior to attending Illinois, he served in the U.S. Army Corps of Engineers receiving the Bronze Star Medal for service in the Republic of Vietnam. His awards include the Walter L. Huber Civil Engineering Research Prize (1979) and the Peurifoy Construction Research Awards (1992) both given by the American Society of Civil Engineers (ASCE). ASCE recognized his achievements with distinguished membership (DIst.M.ASCE) in 2006. Also in 2006, the Construction Industry Institute (CII) awarded him the prestigious Carroll H. Dunn Award of Excellence, CII's highest award. He is a member of the National Academy of Construction (NAC) and was named a Distinguished Alumnus of the Department of Civil and Environmental Engineering at the University of Illinois in 2008. BOLIVAR A. SENIOR is Associate Professor in the Department of Construction Management at Colorado State University. He has extensive experience in the management of construction projects. He headed Senior Brown Associates, Inc., consultants in the area of planning and control, and served as project manager for several companies in his native country, Dominican Republic. He has published many articles and a book in the areas of project planning and control, financial management and construction management education.